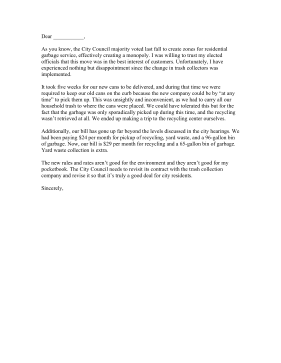 Sporadic and expensive garbage pick-up services are the reason behind this sample complaint letter. As you know, the City Council majority voted last fall to create zones for residential garbage service, effectively creating a monopoly. I was willing to trust my elected officials that this move was in the best interest of customers. Unfortunately, I have experienced nothing but disappointment since the change in trash collectors was implemented. It took five weeks for our new cans to be delivered, and during that time we were required to keep our old cans on the curb because the new company could be by "at any time" to pick them up. This was unsightly and inconvenient, as we had to carry all our household trash to where the cans were placed. We could have tolerated this but for the fact that the garbage was only sporadically picked up during this time, and the recycling wasn't retrieved at all. We ended up making a trip to the recycling center ourselves. Additionally, our bill has gone up far beyond the levels discussed in the city hearings. We had been paying $24 per month for pickup of recycling, yard waste, and a 96-gallon bin of garbage. Now, our bill is $29 per month for recycling and a 65-gallon bin of garbage. Yard waste collection is extra. The new rules and rates aren't good for the environment and they aren't good for my pocketbook. The City Council needs to revisit its contract with the trash collection company and revise it so that it's truly a good deal for city residents.